Upper Venosta Valley is one of the most well-liked destinations for cyclists in the Alps. The stretch along the ancient trading route, the Via Claudia Augusta along the Adige River, is ideal for road cyclists, mountain bikers and recreational cyclers who like to ride through meadows and historic towns in the valley. Regional specialties should be enjoyed in the local inns. As the region in the Alps with the least amount of precipitation, the area around Malles/Mals and Glorenza/Glurns offers good-weather mountain bike tours for beginners and advanced bikers from March to the end of November. Flow trails and steep single trails await the passionate mountain biker and free rider in the Öztal Alps, the Ortles group, the Sesvenna group and the Stelvio National Park. Bicycle route from Switzerland - Tubre in Val Monastero until Malles Venosta. 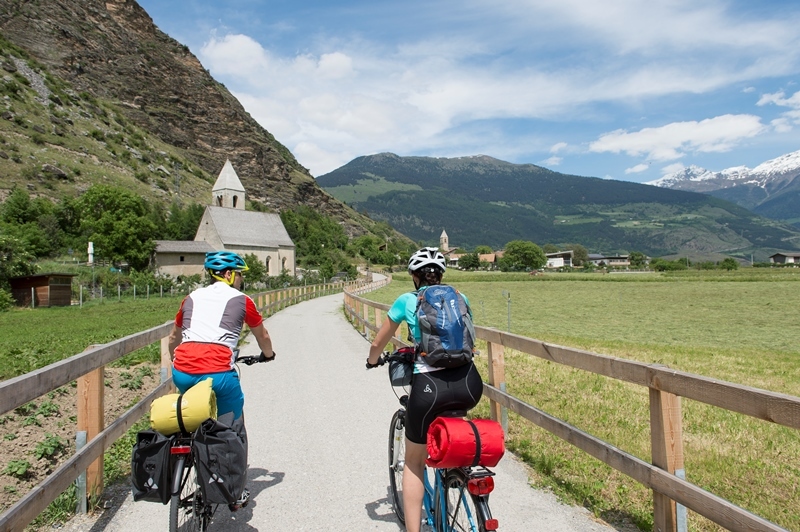 An especially popular route for leisure cyclists is the 80-km Adige Cycle Route which runs slightly downhill along the ancient Roman road known as the Via Claudia Augusta. On this page you’ll find the assortment of bikes that can be rented from Südtirol Rad’s rental stations in the Upper Venosta Valley. With the bikemobil Card you can use all public means of transport in South Tyrol and rent a bicycle for one day of your choice. Available in our information offices.